Home > AMT Blog > See Stephen Stills and Judy Collins Perform Together October 11! 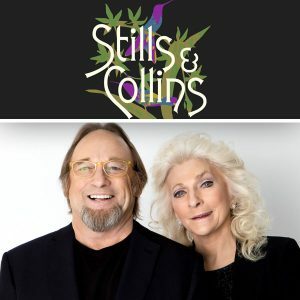 Stephen Stills and Judy Collins share many things – the Rock and Roll Hall of Fame and music genres for starters – but they have never performed on stage together. Until now! In 2017, Stephen Stills and Judy Collins joined forces and hit the road together, marking the first time they’ve ever shared the stage, and on Wednesday, October 11 at 8:00 p.m., that stage will be at AMT. Don’t miss your chance to see these two music sensations perform together! Contact us today to reserve your tickets! Stephen Stills has a career spanning six decades. He is one of rock music’s most enduring figures with multiple solo works and several group contributions. Of his work, he’s known for contributing to four influential groups – Manassas, Buffalo Springfield, Crosby, Stills & Nash, and Crosby, Stills, Nash, & Young. Stills is celebrated and renowned for his instrumental virtuosity as well as his songwriting. He has written several era-defining anthems, such as “For What It’s Worth”, “Love The One You’re With”, and “Suite: Judy Blue Eyes”. Judy Collins is known, and celebrated, for her imaginative interpretations of traditional and contemporary folk standards. In 1975, Collins won Song of the Year for her version of “Send in the Clowns”, described as both “dreamy” and “sweetly intimate”. Adding to her accolades, her rendition of “Both Sides Now” has been included in the Grammy Hall of Fame. This is also the song that launched her into international fame and gained Collins her first Grammy Award for Best Folk Performance. With music legends like these on the stage, you won’t want to miss this show! Join us October 11 for a night of incredible music and unforgettable musical memories. Contact us today at 800-648-4102 or reserve your tickets online!